slow cooker bourbon chicken sandwiches with apple slaw. I have a confession: Sometimes I get overwhelmed in the kitchen. There are those moments when it seems I’ve used every spatula and skillet I own to prepare one simple recipe. There are times when the dish just doesn’t turn out the way I hoped. But more often than not, the recipe turns out better than I expected–and every messy utensil and dish was so worth it. This is one of those recipes. People, these bourbon chicken sandwiches are SO GOOD. I promise. I saw the recipe on Iowa Girl Eats and adapted it ever so slightly. What great flavors! Also, having just returned from the Bourbon Trail in Kentucky, I was looking for an excuse to cook with bourbon. Mmmmmm. There are two parts to this recipe: the slow cooker bourbon chicken, and the apple slaw. They go so good together! These measurements will amount to six generous sandwiches. 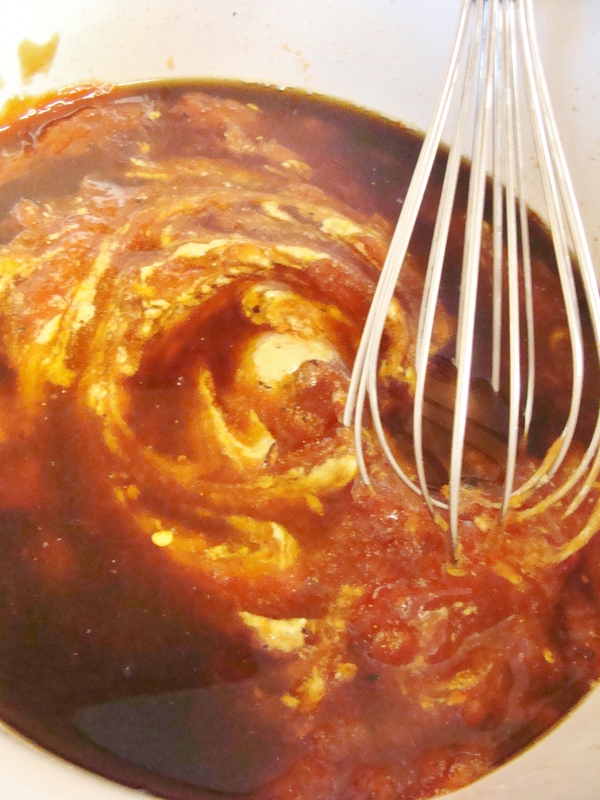 Place all of your sauce ingredients into a large slow cooker. Whisk until blended. Put your chicken breast halves into the slow cooker and cover with the sauce. Cook on low for 4-5 hours, until chicken is tender and pulls apart easily. After your chicken is done cooking—and before you shred it—remove two cups of the liquid from the slow cooker and bring it to a boil in a small saucepan. Lower the heat and let the sauce simmer for 20 minutes or so. It will begin to reduce and thicken. Set this reduced sauce aside. Shred your chicken and keep it in the slow cooker with the remaining liquid. Blend your olive oil, apple cider vinegar, honey, and lime juice in a large bowl. 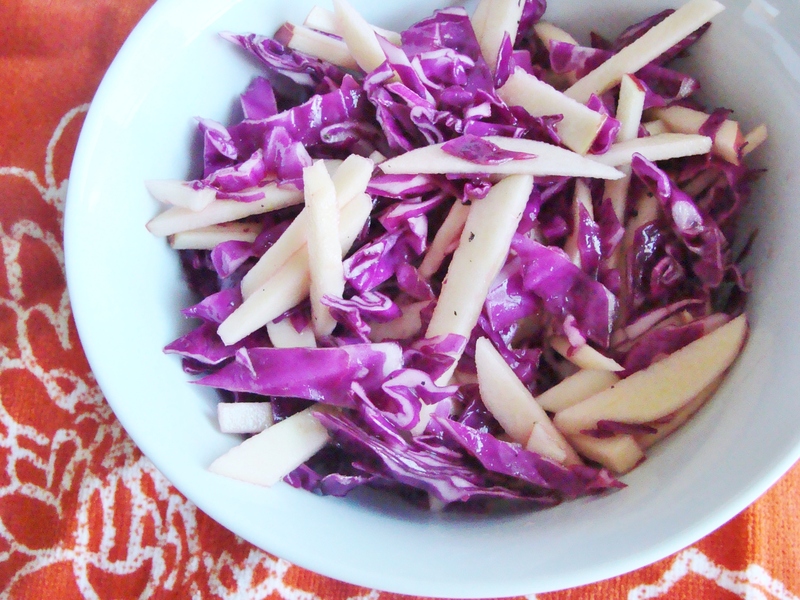 Add your sliced cabbage and chopped apple to the bowl and thoroughly coat. Sprinkle with sea salt. Line a baking sheet with foil, and lay out your bun tops and bottoms. 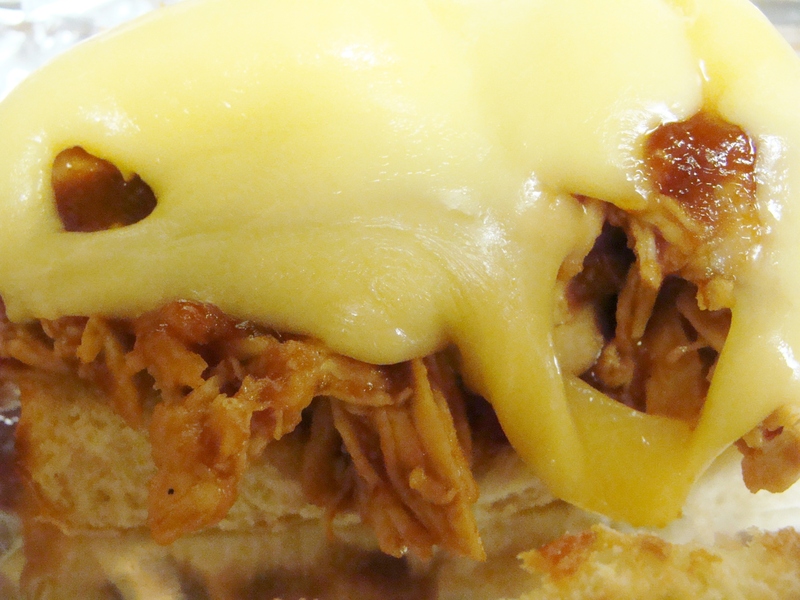 Top each bun bottom with shredded chicken and a spoonful of the reduced sauce, then a slice (or 5) of gouda. Broil for 2-3 minutes, until cheese melts. Keep a close eye on them so the bread turns golden, but doesn’t burn. 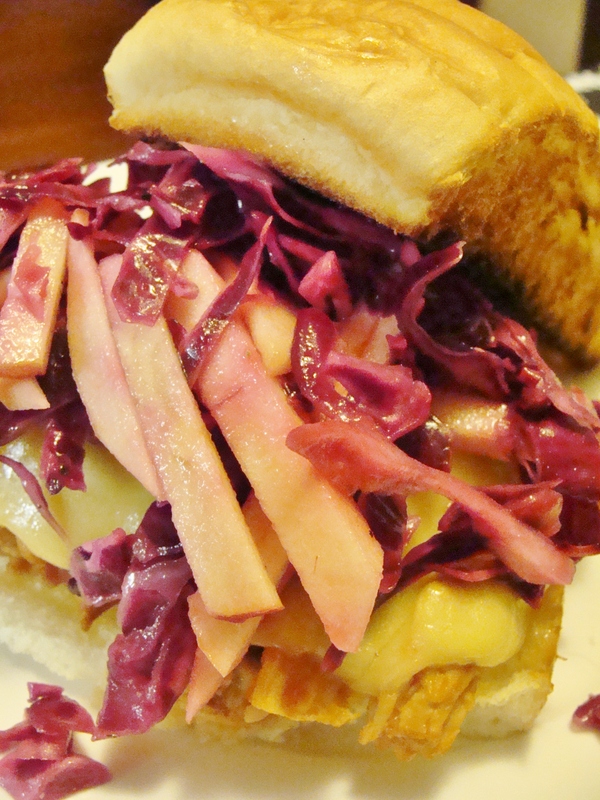 Top each sandwich with a heaping spoonful of the apple slaw. Then: EAT ALL THE SANDWICHES! « butternut squash macaroni and cheese. 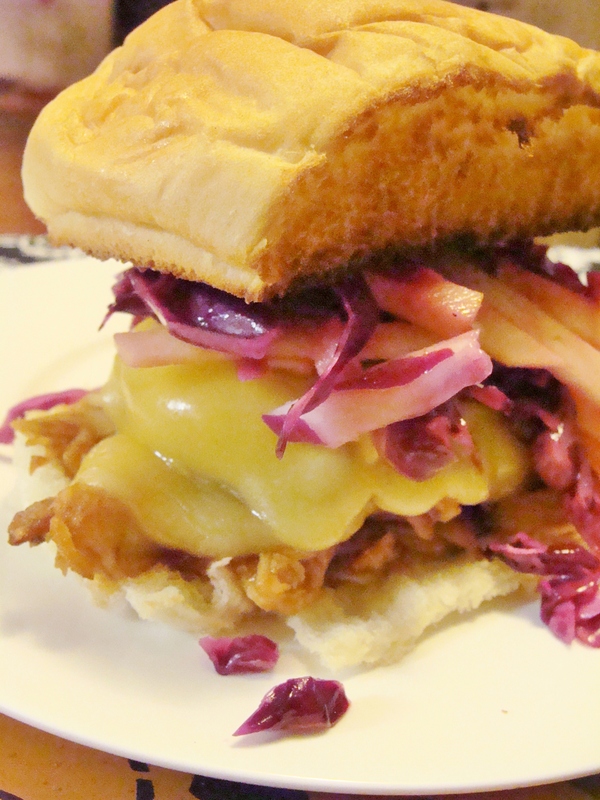 You are currently reading slow cooker bourbon chicken sandwiches with apple slaw. at The Cheesy Kitchen. Categories: chicken., recipes, sandwiches., slow cooker.